Rose Marshall was on her way to prom when her car was plowed off the side of the road. Rose didn’t survive the crash and now, nearly 60 years later, her ghost is legend among travelers. She’s known as “The Girl in the Diner”, “The Phantom Prom Date”, and “The Girl in the Green Silk Gown” to name a few. Really, she’s just Rose; a girl whose life was taken all too soon. Rose would love to move on, but there’s still the matter of Bobby Cross to contend with, the one responsible for Rose’s death all those years ago. Selling his soul in order to gain immortality, he pays for it by taking the souls of others. Rose is the one that got away; Bobby is the one that killed her. These two are on a collision course with one another and Rose is ready to stop running and fight back. If not for herself, then for everyone else who’s in danger of losing their soul to Bobby Cross. I knew I would like Sparrow Hill Road because I’ve enjoyed Seanan McGuire’s other work, but I didn’t realize how much I would love this collection of Rose’s stories. McGuire’s version of the afterlife was at times both beautiful and bittersweet, full of its fair share of dark spots as well. Seanan McGuire took the urban legends surrounding some of the most well-known ghost stories and gave them a name and face. She made it personable, and made me care. I felt so sad for Rose at times. In many of the stories we are reminded of the awful way she left this life to go on to the next as a “hitcher.” At times she can come across as cynical and maybe a touch mean, but when it comes down to it, Rose just misses her life and regrets what she missed out on. In the end she really does right by the travelers she hitches rides with. She helps those that she can avoid accidents, but for the less fortunate she acts as a psychopomp pointing them in the right direction to go afterwards. She’s been witness to many deaths, she taken those she loved and grew up with in her hometown to the beyond, and only rarely are those times anyone’s “time to go.” I would think that would make even the happiest person a little cynical. Regardless, she’s an honorable ghost, and if she counts you as a friend, there’s nothing she wouldn’t do for you. The threat between Bobby Cross and Rose was not something presented right away. Instead McGuire slowly introduced us to Rose’s story and wove Bobby in along the way. Even though there was a lot of emphasis placed on Bobby Cross being the foil to Rose’s hero, it’s definitely not all the book is about. 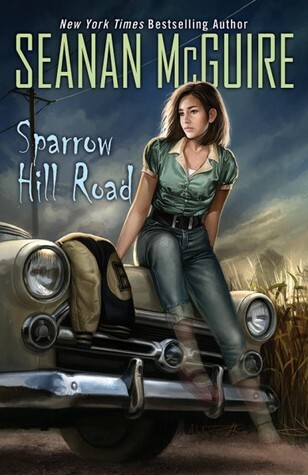 Bobby is part of a much larger picture since he’s the reason for Rose being where she is, but Sparrow Hill Road is first and foremost Rose’s story. No one can overshadow that fact, and this introduction into Rose’s past and present adventure on the Ghost Roads is one that I’m looking forward to continuing. I love Seanan McGuire, and I was thrilled to get this in the mail last week. Your 5 star review has only further motivated me to read it, and read it SOON. I am excite!